Since October 4, 2016, I’ve written the occasional Facebook update, Instagram caption, email, tweet, journal entry, and Christmas card. However, I have been unable to write write. Well, more accurately, I have chosen not to write write. But with 2016 mercifully making way for 2017, I feel like it’s time to stop avoiding the unavoidable. I simply can’t write about anything, until I write about this. My mom died on October 4; the very same mom I was able to write about here in present tense, just this spring. Back then, ten lifetimes ago, she was still working and laughing and sassy and loving and generous and wise and wonderful. As I wrote about her, I was acutely aware of just how present tense she was. I cried the first time I read the essay out loud, fully aware that the things I had written were usually saved for eulogies. The essay was better than a eulogy, I reasoned, because she was able to read it and see how much I admired her. And she did read it, and she loved it, and she printed it out and showed her friends. Then without warning, I was including parts of that essay in her actual eulogy, reading it with my brother at my side, next to her casket, in front of my dad, family, friends, and strangers in a church that was built on the site of the school where my mother served as the last school secretary, and where my husband the preacher was orchestrating a tender, beautiful, perfect-for-Mom service. 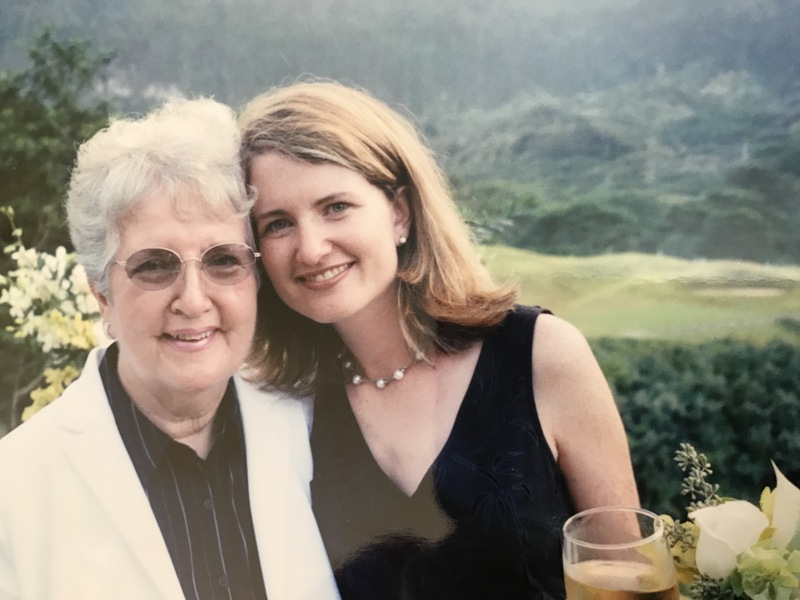 Mom’s passing was sudden and wildly unexpected, which of course made for a total nightmare. You immediately lament the goodbyes you never had. So many other people get goodbyes, why didn’t you? Then you realize that in order to get the goodbye, your loved one needs to be dying, and that is the last thing in the world you would want. So instead, your jealousy turned to gratitude, and then immediately to disbelief tinged with a teensy bit of resentment that you are in the position of having to be grateful for such a terrible thing. But you are…you are so thankful this woman you loved was fully in the present tense to the very end. And she would have hated being sick; she was good at a lot of things, but being sick was not one of them. The first hours after the unimaginable becomes real, are fuzzy and clear all at the same time. You’re numb, but you notice every single thing. The days run together, and you are unsure of what to do about anything, or how to manage your horrible thoughts, or your unwieldy emotions or the weirdness of your surroundings. You notice the tears come at strange intervals, which makes you self-conscious about how you are grieving. You understand you are still in shock, and that the worst part is still to come and you sporadically entertain the thought that this was all just a terrible mix-up, and your mother is perfectly fine somewhere, and just wants to come home. You feel sorry for yourself and think about how life will never be the same, and you’ll never be the same, and why are we even born if we’re just going to die? You and your family swap memories, and you cling to each other because you have to, and because you can, and you haven’t been together in this intense of a way, well, ever. At the very same time you’re wallowing in the muck, you somehow find yourself on the receiving end of the best things humanity has to offer. The purest love and kindness pour over you from your friends and family, and you muster the strength to pour it right back without obligation. But also somehow, some of your greatest comfort and practical help comes from the strangest places…From the man who keeps his shop open late so he can fit your dad for a suit then offers to press his shirt for free before the memorial. From the neighbors who bring wine and the other neighbors who bring breakfast and the other neighbors who haul out the garbage for you. From the cousin you don’t really remember having who finds you a church to use for the memorial since Mom and Dad’s church is getting renovated. From the endless string of people responsible for coffee cakes and hams and pizzas and flowers and the tiny little lady you’ve never seen before who delivers a pot of chili that’s nearly as big as her. From the diner waitress who saw the obituary and came to the service because your parents were her customers and always so nice to her. From the bank teller and the pharmacist who were crushed to hear about Mom, because she was always so nice to them. From Mom’s teenage co-workers who showed up– one even riding his bicycle all over town to get there– because, guess what, Mom was so nice to them. When you’re perfectly entitled to disappear into grief, you can’t. It’s still not about you. You are suddenly connected to the world in a new way through the absence of someone you loved. You’re thankful against your will again, because you are overwhelmed with evidence that you were justified in loving and admiring this person, because she impacted people throughout her whole life in ways she never even knew. And you got to be her daughter. And you still get to be her daughter. Present tense.